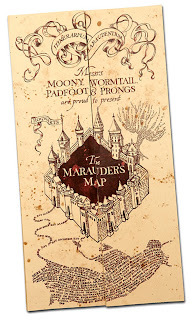 Here is a quick, fun tutorial on how to make an impressive Marauder's Map. It was rather painless to make, the longest part was staining them. 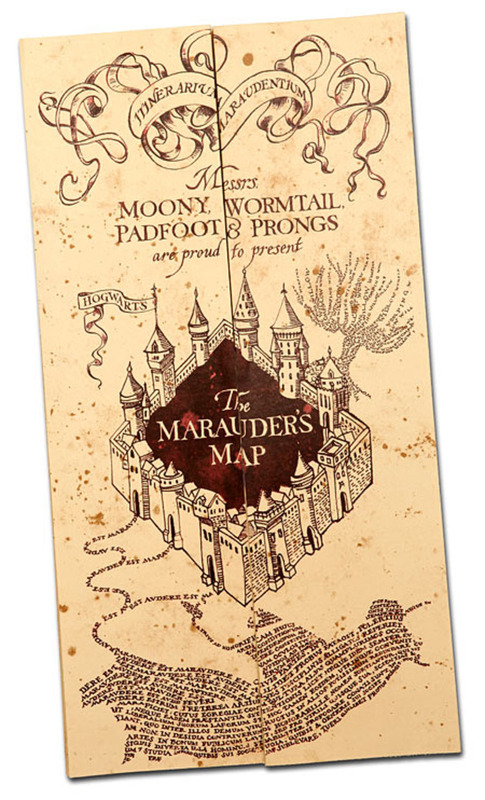 If you would just like a prop Marauder's Map (i.e. 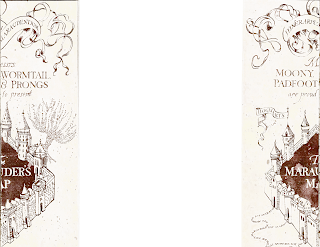 You don't care about using it for a party and would simply like to have your own Marauder's Map), you can go to this tutorial. 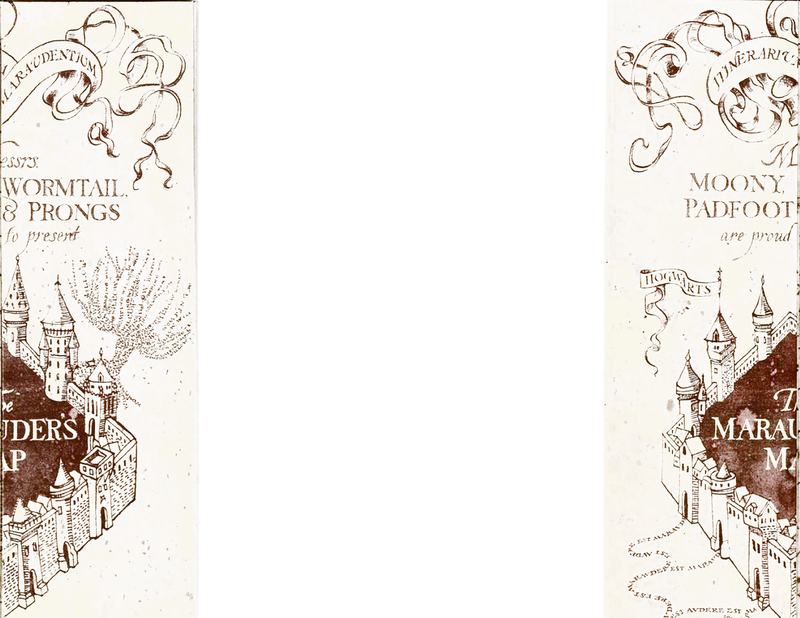 These maps were made to be used in activities and thus contained an actual map of the location of the party. First, I have provided the outside of your map for you below above, just under the first picture. If you fold the ends in to the center, you will get a map that looks similar to the picture at the top, however, it will be white for now. Any of those options would work. I chose #1 because I have Photoshop and am rather good with computers. Bedrooms – Astronomy Tower, Arithmancy Classroom, any sort of classroom name including Transfiguration, Charms, Muggle Studies, Divination, etc. If you have any other suggestions, feel free to comment and I'll add them! When you have finished creating and labelling your map, print them out so that the picture at the top is on one side of the paper and your map is on the other. You can fold it in now, but it's easier to just wait. This map went over really well, and many of my friends now display it in their bedrooms! It's such a simple craft but really looks fantastic when it's finished. This is a tutorial on how to make easy magical wands for your guests. They're relatively simple and don't take long; the longest part is waiting for them to dry. They are made primarily of paper and glue but end up quite sturdy at the end. I found this tutorial on instructables.com and found it very useful. They also have some good pictures so that you understand what we mean with these steps. Stick a strip of double-sided tape diagonally across your paper. You can skip this step (we did), but it helps to keep the paper wound tightly. Another idea is to put a straw diagonally across the paper or a barbeque skewer or something similar to make the wand stiffer, however, we found that they ended up quite stiff without any of that. Tightly roll the paper, beginning in the corner and working to the opposite corner. Roll it slightly diagonally so that one end of your wand is slightly larger than the other. Once you’ve rolled about halfway, take some glue, preferably white, and smear it on the unrolled section of paper. We used a plastic paintbrush and painted some on. Make sure you get it right to the edges of the paper for the best stick. Continue to roll the wand up until you reach the end of the paper. Hold the wand together tightly so that it dries. You may have to hold it for a few minutes. When you’re sure that the ends will stay on, let it dry for a bit longer so that the paper isn’t soggy. Now snip the ends off so that they’re flat and dribble some glue into one of the ends (we did the larger one first). You can use white or hot glue, but we used white so we wouldn’t use up all the hot glue. However, the hot glue dries much faster and probably a bit stiffer. After sticking some glue into the end, take a square of toilet paper (or a small bit of scrap paper, tissue paper etc.) and roll it up, then stuff it into the hole. Dribble a bit more glue on top of the paper and repeat. If you need to, don’t hesitate to use a pencil or barbeque skewer etc. to shove the toilet paper down more. Once all that is dry, use some hot glue to create a round end at the bottom of the wand. We found that a very useful way to let the wands dry was by using the toilet paper roll and putting the ends of the wands in it so that it dried standing up. Now after filling the other end of your wand and letting it completely dry (you may have to wait overnight), create some details on the wand with the hot glue. You might want to make a vine pattern, or you can layer it to make a handle. Paint your wand in the colour of your choice. We used a dark bronze spray paint. And your wands are ready for spell casting! These are the simple crafts of the party. They each took maybe 5 minutes. 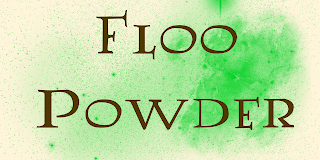 Here are a few quick tutorials for Floo Powder (which guests can take home), Remembralls (for decoration), and the Golden Egg from the Triwizard Tournament (useful for activities). Mix the salt and food colouring in a small bowl until the salt is uniformly coloured. Spread the mixture out in an even layer on a foil-lined baking sheet. Bake in the oven for 10 minutes at 350 degrees Fahrenheit. Allow your homemade glitter to cool before using it. Can be stored in an airtight container for several months. Quite simply, mix together your sparkles (if applicable) or dye your sugar green, and put it into the bottles. Print off the picture provided below and resize it to fit your bottles, then glue it on. And voilà! 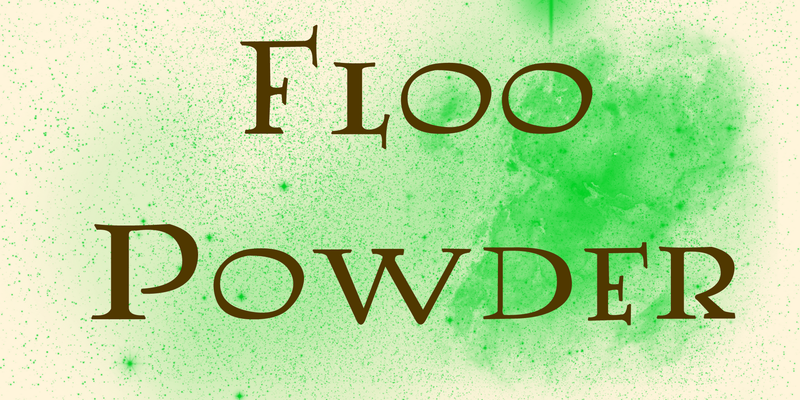 A cute little bottle of Floo Powder to give to your guests! A tutorial for how to make your own Quidditch-worthy broomstick! This one was our own version of Harry Potter's "Nimbus 2000". Tie the sticks firmly to the broom by wrapping the twine around and tying it in knots multiple times. Adjust the positions of the sticks so that they are evenly spaced around the bottom of the broom. Dribble hot glue in the spaces and around the twine to secure it firmly. It was useful to have one person rotating the broom while the other person applied the hot glue. You may have to go around a few times: once around the top of the twine, once around the bottom of the twine, and once to ensure the gaps were filled (this is why you need a lot of hot glue). Follow steps 3 & 4 with the medium sticks and then the short sticks, allowing the glue to dry in between. Leave your broomstick for about a day or two (or longer, it won't hurt) so that the twigs stay in that shape. When you are ready to take the twine on the end off, trim any twigs that still haven't achieved the broomstick shape. There you go, your own home-made broomstick! If you want to go the extra step farther and you happen to have an engraver, you could also engrave the words "Nimbus 2000" onto it like we did. It made for a neat effect, and you could even fill it in with gold paint! Another lovely sweet for your Harry Potter Party! I made this "recipe" up, seeing as I really wanted to give my friends chocolate frogs yet I did not own a candy frog mould nor did I know anyone who possessed one. It's ridiculously easy and will take you less than twenty minutes, less if you've already got the icing made. Of course, there are plenty of other ways to make these, including a bit more home-made ones such as actually making the chocolates yourself, however, this is a very easy way to do it :) I was also lucky because the Turtles that I used came on sale during the holiday season so I got them for a fairly decent price :). Here's a link to a recipe on About.com that detailed a simple way of making your own version of these treats if you so desire. This is also the same recipe that I used to fill the Cauldron Cakes, you can find the post by following that link. This was sort of our generic icing recipe, I also used it to coat the edible snitches. Put your chocolate turtles onto the wax paper and pipe out little feet for them. Try not to make the toes too long, or the icing will break when you try to take it off the paper. Pipe small blobs onto the top as the 'eyes'. Take a small nonpareil or sprinkle etc. and pop it into the middle of the eye as the eyeball. If you do not have any substitute that you can use to do this you can just use a toothpick to poke out a small hole in the icing as an eye. Voilà! They're super cute :) Everybody loved them! This guy got a wee bit mutilated from his one eye and a couple of his feet, but overall you get the idea, they were so cute! P.s. our Marauder's Map is in the corner - tutorial on that later!